The characteristic shape of the Galician coast, abrupt, cut and full of entrances carved by the sea over millennia, allows the existence of magical places like the Fuciño do Porco. This enclave of curious name (translated as “pig’s snout”) is located in O Vicedo, the westernmost council of the coast of the province of Lugo, and has become in recent times, and rightly so, one of the most visited places by lovers of hiking. The main reason is the beautiful landscape of the route, perfectly signposted. The final section runs practically hanging above the sea, thanks to some footbridges that make the Fuciño do Porco (also known as Punta Socastro) into a small Chinese Wall above the sea. It also helps that the route is apt for almost anyone, although we must take into account some things before embarking on the adventure: to reach the end there are at least a couple of pretty steep slopes, that can be overcome by anyone minimally trained in hiking; you have to be always aware of where you are stepping, especially along the footbridges, and, most of all, if the route is made with children; and, finally, that the wind often blows strongly. The route begins in the parish of San Román, well known for its large beaches of fine sand. To get to the Fuciño do Porco you have to look out for the indicated intersection from the coastal road, the LU-862, which leads to a small car park where the car must be left. The first part of the route runs through a forest track easy to traverse. On the right, among the trees, the silhouettes of the Viveiro estuary are drawn, with the beautiful beach of Area and the Punta do Faro in the foreground. In the interior of the bay is the small city of Viveiro, while the municipal capital of O Vicedo is located several kilometres west of San Román. Once the top is reached begins the descent towards Punta Socastro and, with it, the footbridges. They were built recently to reach the maritime beacon located in the far north with more ease. Few people approached the Fuciño do Porco (so-called because of its flattened appearance on the map) until now, and much of what is seen in the surroundings is very rarely frequented even by the residents of the area. The small beach of Pereira, which displays to the west its grey sands, is almost always empty and has a difficult access, for example. The footbridges cross the steep isthmus that links the coast with the end of the cape, which can be reached through a steep downward ramp. The view from the beacon is amazing. The Cantabrian sea opens to the north crashing wildly against the rocks of Punta Socastro. To the west you can see the brutal granite masses of Coelleira Island and Cameiro Point, in the foreground, and Estaca de Bares behind them. 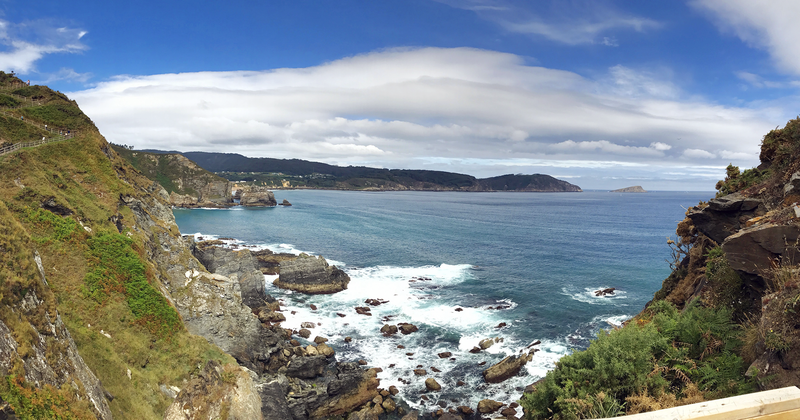 Towards the east, the hacked coast of the Concello de Xove, with the Roncadoira point standing out. And, if you look towards the land, you can see the path travelled and the footbridges of the Fuciño do Porco twisting over themselves to overcome the gap to a place thankfully rediscovered on the north coast of Lugo.